Angelic Ballerina, Red Hair by Oopsy daisy - This unique ballerina kids' art was created by Oopsy daisy artist Kristina Bass- Bailey. This ballet art incorporates collage elements that layer words, black stamps, and unique details in the background of the artwork. The artist is known for her unique style of layering paper and incorporating them into the background, creating a vintage-style. Please be sure to view the ballet print carefully to see the details of the collage style background. It is a unique style and part of the original artwork. 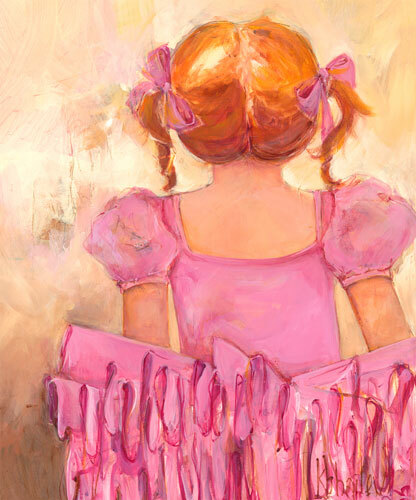 Each Angelic Ballerina, Red Hair canvas is printed on museum quality canvas using the Giclee printing process. Oopsy daisy stretched canvas art is printed to order using the best digital reproduction method available. Each piece of kids' canvas art has amazing clarity and color saturation. After printing, the canvas is hand stretched over a custom built wood frame. The wood frame is 2" thick for a substantial look. The canvas wraps around the sides providing a finished, decorative side, so framing is not necessary. The back of the artwork includes a sawtooth hanger for hanging and an artist biography. The canvas is extremely durable and can be cleaned with a soft cloth that is dry or slightly damp.